I'm going to be doing a guest post in a few days on one of my lovely friend, Donna's pages. I'll be sure to let you know when I do. I've been seeing so much of these guest posts and it seems to wonderful. It's nice to see what life others can bring onto our blogs that we spend everyday writing out our thoughts. I enjoy hearing love stories and how people met their significant others. When I meet my friend's parents a common question I ask is how they met. Oh, I love LOVE, can't you tell? *Your name (blog name) of course. *Website as well any other links facebook/twitter, etc. *A picture that goes along with your story, only if you're comfortable doing so. I am very excited for this journey and to hear these love stories as well learn more about all of you. Thank you so much! I even made a new cute button for this special, fun project! 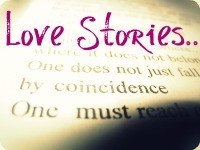 Please see the new page at the top titled Love Stories which you can find all the information about this project!